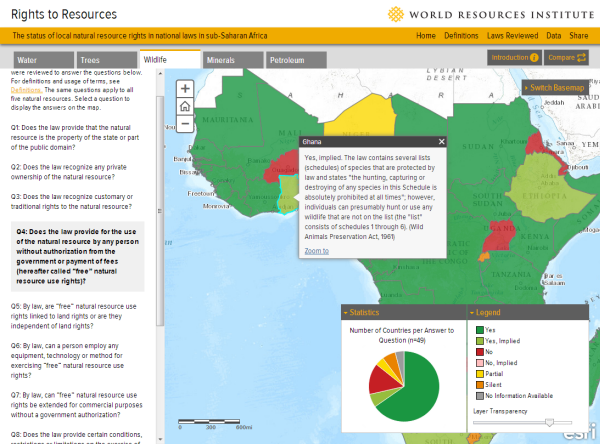 The World Resources Institute (WRI) announced today the launch of their newest online mapping application, the Rights to Resources map. Built by Blue Raster, the tool visualizes resource rights in Africa and allows users to compare findings across countries and resources: water, trees, wildlife, minerals and petroleum. The data displayed in the tool is the outcome of WRI’s systematic review of the national framework laws across the 5 resources. The results of which confirm long suspected notions that across sub-Saharan Africa, few national laws provide communities with strong, secure rights to the resources on their land and that rights to many high-value natural resources are held by the state. The new Rights to Resources application endeavors to strengthen and secure resource rights for communities in sub-Saharan Africa while incentivizing sustainable management of local resources. To learn more about the project and review the application, check out WRI’s Land and Resource Rights project page.